Scott Eastwood’s character, Jackson, gets one hell of an entrance in “Diablo”: the door to a burning house flies open and, backed by a wall of flames, he appears in shadow in the doorway. When he steps into the light, one sees that the resemblance to Eastwood’s father, Clint, is striking. Our minds immediately flash back to Clint’s westerns, many of which “Diablo” blatantly rips off. “The Outlaw Josey Wales," “Unforgiven” and “High Plains Drifter” all receive shout-outs as the younger Eastwood goes through the familiar paces of revenge and regret. Unfortunately, his first Western fails to be as good as any of the films it evokes. Its plot is an unholy blending of “Taken," “The Searchers” and "Angel Heart." As befitting a January release, it’s also an early candidate for the 2016 worst movies list. “But who prays for Satan?” an onscreen quote by Mark Twain asks at the beginning of the film. (The answer is Satan’s grandmother, but I digress.) We are next informed that it’s 1872, seven years after the Civil War. Jackson fought under General Sherman, and as “Diablo” opens, Jackson’s wife has been kidnapped by the folks who torched his house. “She’s been taken,” Jackson explains to anyone who will listen, and one hopes he’ll have a particular set of skills to get her back. The kidnappers spoke Spanish, so Jackson heads toward Mexico. Along the way, he encounters Walton Goggins and Danny Glover, both of whom deserve better. Jackson seeks help from Glover’s character, whom he fought alongside during the war. Before they meet up, Jackson receives help from some Indians who tend to his wounds and offer him peyote. (The ensuing hallucination is not only poorly executed, it cribs from, of all things, “An American Werewolf in London.”) For their troubles, the Indians all wind up dead. In fact, anyone who tries to help Jackson winds up dead. That the victims are all minorities made me briefly consider that perhaps screenwriter Carlos de los Rios was attempting some kind of statement about American manifest destiny. Considering how preposterous this movie becomes, I realized I was giving the screenplay too much credit. At least Goggins brings a smarmy, slimy, threatening energy to the film. His character is a major cop-out that you’ll see coming long before the big reveal. But he makes the most of his miniscule screen time by cutting a dashing figure of evil, the rather seductive kind one might expect from Old Scratch himself. By contrast, Glover is little more than onscreen collateral damage. He provides some crucial information to the viewer regarding Jackson’s character before buying the farm. Glover’s tense scene with Goggins, which serves as the last appearance of either actor, is the moment “Diablo” becomes irredeemably bad. “Diablo” goes for shock value with its twists, but plays its hand far too early. Our knowledge of events and of character force us to question why the people in the climactic scenes act as stupid as they do. The villain of this piece has a reputation that precedes him as a notorious killer, yet whenever someone gets an opportunity to do him in, they are either too afraid to blow him away or shoot with the accuracy of a Stormtrooper on the Death Star. One unfortunate woman even makes out with him before being shot. “Why do you do this to all the women?” she asks. Your guess will be as good as hers. Clint Eastwood’s career is full of performances where he was unafraid to deal with the darker natures of his characters, and with their weaknesses. 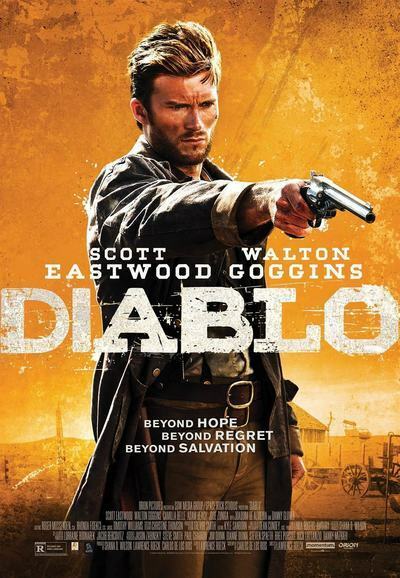 “Diablo” wants to cover similar ground, but gives Scott Eastwood very little of substance to play. As a result, he’s merely an enigma who sheds or gains characteristics where convenient. The movie impresses on his empty canvas whatever is necessary at the moment, while horror movie music hints at a doom that turns out to be deeply unsatisfying and almost nonsensical. If nothing else, “Diablo” looks great, thanks to veteran cinematographer Dean Cundey and whatever deity carved Alberta, Canada out of the Earth. There are some majestic overhead shots of scenery, and it’s clear that thought and care was put into the framing of scenes. I wanted to see the Western that deserved this level of visual attentiveness. Unfortunately, “Diablo” isn’t it.